The DR Congo is facing a major political crisis over the 30 December election's result. A recount would allow subsequent negotiations to take place on the basis of a clear understanding of who won. 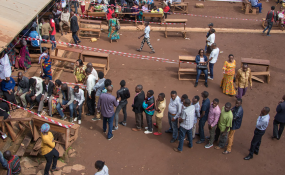 A dispute over the results of the DR Congo's 30 December election cast a dark shadow over what should be a historic transition of power but a surprisingly robust reaction by regional actors offers a genuine chance for a course correction. According to official tallies, opposition leader Felix Tshisekedi was the winner, but these stood in stark contrast to a parallel count by Congolese Catholic Church observers, which indicated a landslide for Martin Fayulu, another opposition leader. Data leaked from sources within the electoral authorities confirm the church's figures, strongly suggesting an effort to rig the vote in favour of the opposition candidate more palatable to incumbent President Kabila and his allies. On 17 January, the African Union (AU) unexpectedly issued a statement questioning the official results, calling for a suspension of final results, and dispatching a delegation to Kinshasa on 21 January to help Congolese parties reach consensus on next steps. To both reflect the will of the people and avoid a dangerous confrontation, that delegation should push for a recount, so that subsequent negotiations on a way forward can take place on the basis of a clear understanding of who won. All international actors should throw their weight behind the AU's initiative, appeal for calm and encourage the putative winner, Fayulu, to adopt a conciliatory approach toward his rivals. On Sunday 30 December, millions of Congolese voted for a new president and provincial and national lawmakers. The presidential election pitted Emmanuel Ramazani Shadary, the preferred candidate of incumbent President Joseph Kabila, against two opposition leaders, Felix Tshisekedi and Martin Fayulu, the latter supported by two political heavyweights, Jean-Pierre Bemba and Moïse Katumbi, who had been barred from contesting the vote. Despite repeated delays and the unwarranted exclusion of around 4 per cent of the electorate, balloting passed off in relative calm. Since then, however, a major political crisis has erupted over the results. Before the Independent National Electoral Commission (CENI) released its official tallies, the Episcopal Council of the Congolese Catholic Church, known as CENCO, which had deployed some 40,000 observers to monitor the polls, reported that its parallel tabulation had revealed a clear winner and, though it could not legally name a victor before official results were proclaimed, sources close to the church confirmed a landslide win for Martin Fayulu. In contrast, the CENI's provisional results, released on 10 January, indicated Tshisekedi was the victor, with 38.6 per cent of the vote to Fayulu's 34.8 per cent and Shadary's 23.8 per cent. The provisional results also showed President Kabila's political coalition winning a large majority in of the national legislative and provincial elections, thus appearing to ensure his coalition's continued political dominance. By now, the CENI results have been widely discredited, viewed as the result of manipulation by the electoral authorities to secure a win for an opposition candidate that Kabila and his allies view as more conciliatory. Indeed, data leaked from the CENI makes clear that Fayulu decisively won, perhaps with as much as some 60 per cent of votes (similar to CENCO's estimates). Fayulu has rejected the results and appealed to the Constitutional Court, which is generally regarded as pro-Kabila. By law the Court must adjudicate the election dispute by 19 January. Initial reactions from Western and African diplomats were muted. Some Western countries questioned the CENI's results, but many appeared to view Tshisekedi's win as presenting a silver lining: Kabila's preferred candidate had been roundly defeated, Kabila himself was out - no mean feat given his earlier determination to stay on - and perhaps the DR Congo could turn a page on the mismanagement and corruption of his rule. Declaring the vote a sham and trying to force a Fayulu presidency, they feared, could provoke a dangerous backlash from pro-Kabila forces who still dominate the security forces - a crisis for which they lacked the will or capacity to deal. In contrast, many surmised, backing Tshisekedi's, or at least not rocking the boat, might strengthen his hand against Kabila, who it seems is intent to retain influence through parliament and the powerful security sector. Moreover, it was unclear early on how the region would respond and, without African support, Congolese leaders could portray Western pressure as unwarranted meddling. African leaders began by reacting cautiously as well, calling for any challenges to results to be pursued legally and for consensus. That a statement critical of the elections by Zambian President and chair of the Southern African Development Communities' (SADC) Organ on Politics, Security and Defense, was rebuked by some of his counterparts illustrated the depth of divisions in the region. The surprise came on 17 January, when an ad-hoc high-level meeting of the AU put out the strongest statement from the continent. Saying "there were serious doubts" about the provisional results, it called for the "suspension of the proclamation of the final results [by the court] of the elections". The AU announced it would send a high-level delegation on Monday 21 January to Kinshasa to "interact with all Congolese stakeholders, with the view to reaching a consensus on a way out of the post-electoral crisis in the country". The dramatic AU statement and forthcoming visit offer a path forward. The delegation should push for some form of recount or audit, potentially monitored by SADC or the AU, both of which fielded observers for the vote. Such a process could be concluded quickly, since electronic election data, transmitted by the voting machines, is available (observers' vote tallies based on copies of results sheets in the polling stations might potentially be used to validate that data). This exercise should be conducted for presidential, parliamentary and local elections. Indeed, the starting point for any credible negotiations among Congolese leaders should be a clear understanding of who genuinely won on 30 December. All international actors should throw their weight behind such a process. Of course, a recount presents risks. Politics in Kinshasa are already deeply polarised and a recount could divide them still further. It is unclear how Tshisekedi's supporters would respond to having his victory, in their eyes, snatched away. Perhaps more dangerous still, President Kabila and his allies, particularly powerful figures in the security sector, could well resist, given the wariness with which they regard Fayulu, Bemba and Katumbi. Indeed, on 18 January, both the government and Felix Tshisekedi allies rejected the AU's call to delay the proclamation of the final result of the presidential vote. The government accepted talking to the AU's delegation but Tshisekedi's party clearly fears being denied the presidency. The goal of African and Western leaders should be to both ensure that the will of the Congolese people is respected, and prevent a destabilising and costly confrontation. They can promote this outcome by taking several steps. To begin, they should strongly urge all Congolese parties to call for calm and eschew violence. The purported victor, Fayulu, and his allies have a special responsibility to reassure those in both Tshisekedi's and especially Kabila's camp. At the same time, the AU delegation should warn that if Tshisekedi's inauguration goes ahead, it and the regional organisations of which the DR Congo is a member would consider punitive measures, including refusing to recognise the new government with all that would entail for those involved. Regardless of the precise formula, the outcome should allow the DR Congo's leaders to leave their political trenches and work with their international and regional partners to begin dealing in earnest with the key sources of instability in large parts of the country and the dire socio-economic situation that most Congolese citizens continue to endure. If they act wisely, they at long last have a chance to do that.